BEIJING, Jan. 3 (Xinhua) -- China's Chang'e-4 probe touched down on the far side of the moon Thursday, becoming the first spacecraft to make a soft-landing on the moon's uncharted side, which is never visible from Earth. The probe, comprised of a lander and a rover, touched down at the preselected landing area at 177.6 degrees east longitude and 45.5 degrees south latitude on the far side of the moon at 10:26 a.m. (Beijing Time), the China National Space Administration (CNSA) announced. With the communication assistance of the relay satellite Queqiao (Magpie Bridge) the probe sent back the first-ever close-up photograph of the moon's far side, opening a new chapter in lunar exploration. After the Beijing Aerospace Control Center sent an order at 10:15 a.m., the Chang'e-4 probe, launched on Dec. 8, 2018, began to descend from 15 km above the moon with a variable thrust engine being ignited, according to CNSA. The Chang'e-4's relative velocity to the moon was lowered from 1.7 km per second to close to zero, and the probe's attitude was adjusted at about 6 to 8 km above the lunar surface. At 100 meters up, the probe hovered to identify obstacles and measured the slopes on the surface. After avoiding the obstacles, it selected a relatively flat area and descended vertically and slowly. The probe then landed in the Von Karman Crater in the South Pole-Aitken Basin. "It's an important milestone for China's space exploration," said Wu Weiren, chief designer of China's lunar exploration program. 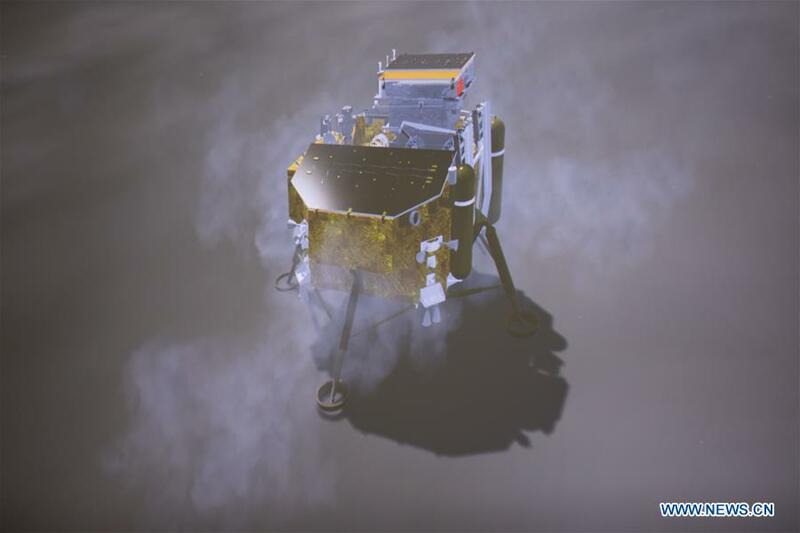 "It is a perfect display of human intelligence," said Jia Yang, deputy chief designer of the Chang'e-4 probe, from the China Academy of Space Technology (CAST). "Landing on the far side of the moon is more risky than landing on the near side. The rugged terrain on the far side has raised many problems," said Sun Zezhou, chief designer of Chang'e-4 probe, from CAST. "But solving those problems might help lay the foundation for future space exploration. High-precision landing is a necessity for further exploring the moon and asteroids. We hope to be able to reach the whole moon and even the whole solar system," Sun said. The moon is tidally locked to Earth, rotating at the same rate that it orbits the planet. Therefore, only one side of the moon is seen from Earth, leaving the far side a mystery before the age of spacecraft. Many lunar orbiters have shown the moon's two sides are very different: the near side is relatively flat, while the far side is thickly dotted with impact craters of different sizes. Scientists believe that the lunar crust on the far side is much thicker than the near side. However, the reality is still a mystery, and only on site exploration will reveal the truth. "The far side of the moon has unique features never before explored on site," said Zou Yongliao, director of the lunar and deep space exploration division of the Chinese Academy of Sciences (CAS). "The exploration of this virgin land by Chang'e-4 might bring breakthrough findings." The probe will conduct low-frequency radio astronomical observation, survey the terrain and landforms, detect the mineral composition and shallow lunar surface structure and measure the neutron radiation and neutral atoms to study the environment on the far side of the moon, according to CNSA. For astronomers, the far side of the moon is a place of ideal tranquility, as the body of the moon shields against radio interference from Earth. From there, they can study the origins and evolution of stars and galaxies, peering into the dawn of the universe. Chang'e-4's low-frequency radio astronomical observation on the moon's far side will fill many gaps in astronomical observation. The probe also took six live species - cotton, rapeseed, potato, arabidopsis, fruit fly and yeast - to the lifeless environment to form a mini biosphere, which is expected to produce the first flower on the moon. Chinese space engineers also plan to measure temperatures on the surface of the moon day and night. The Chang'e-4 mission, including the probe, the relay satellite Queqiao and a micro satellite orbiting the moon, is equipped with four payloads developed through international cooperation, providing more opportunities to the world's scientists and combining human expertise in space exploration. Johan Koehler, head of Solar System Science and Space Situational Awareness, Swedish National Space Agency, said the exploration of the far side of the moon was a great achievement by China. "We are very happy to be a part of it." Named after Chinese moon goddess "Chang'e," China's lunar exploration program, which began in 2004, includes orbiting and landing on the moon, and bringing samples back to Earth. "Exploring the far side of the moon is one contribution China is making to the world. Although we still don't know what we might find, this exploration might influence several generations," said Shen Zhenrong, a designer of the lunar rover. Wu Weiren said: "Exploring the unknown is human nature. The moon is a mysterious world to us. We have a responsibility to explore and to understand it. Exploration of the moon will also deepen our understanding of Earth and ourselves."